Perfect compatibility with Samsung Galaxy Gear S3 Classic / Frontier smartwatch. for the charger's working life. Or you can use a 5V/1A plug to charge. charging to avoid unnecessary warming. as soon as possible and make you satisfied. Replacement Charger Dock for Samsung Galaxy Gear S3 Classic / Frontier Smart Watch,not fit for any other models. 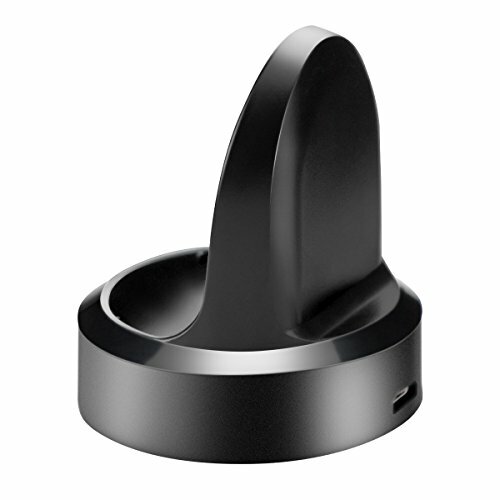 Charging method:sensing mode with magnets,PTC (Power Protection Inside) keep your Samsung Galaxy Gear S3 Classic / Frontier safe from over-current or over-charging when connected it power source. Non-slip design:the bottom plate is with a round of silicone strap to prevent from slipping. Package include USB cable and Charging Dock. If you have any questions about this product by Arifoo, contact us by completing and submitting the form below. If you are looking for a specif part number, please include it with your message.